I woke up today, watching a video of a big sister and her younger brother, interacting in their own special way. A knowing smile emerged. After a little investigating (a.k.a. Facebook stalking), I found another video from the boy’s mom, which gave the backstory of this tender moment between siblings. Cue the waterworks. If you don’t know why this undid me, you should meet my brother, Brian. Brian is thirty-eight. In recent years, his verbal skills have regressed, but that hasn’t totally deterred his communication. Brian communicates with us in his own way, whether it’s stacking three baseball caps on his head, shaking his booty, pointing to an page in the encyclopedia, writing a few words on his Magna Doodle, laughing at good ole’ fashioned potty humor, or wearing as many sports’ team shirts as he can muster at once (he’s loyal and sentimental through and through). Brian is two and a half years younger than I. And I don’t remember life before him. 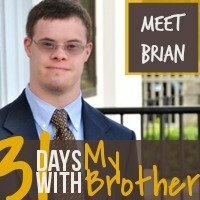 I have two younger sisters, born after Bri, so I can’t tell you what it is like to have a brother who doesn’t have special needs. I would be lying if I didn’t admit I’ve wondered what it’s like to have a brother who could drive me around (I once let Brian “drive” my car in a church parking lot, while I manned the pedals from the passenger’s seat. You should have seen the look on my mom’s face!). But as I’ve wondered what might have been, I’ve also realized the depth of what I already have: a brother whose love does not waver or change with age, distance or loss of abilities. Brian has taught me more than most. About six months ago, I was introduced to the Enneagram (which is an ancient pathway for better understanding yourself and others) and I discovered I am a Type One. According to The Enneagram Institute, Type 1’s are: always striving to improve things, but afraid of making a mistake. And their key motivations are that they: want to be right, to strive higher and improve everything, to be consistent with their ideals, to justify themselves, to be beyond criticism so as not to be condemned by anyone. Pair this “type” with my firstborn-ness and you can imagine how much I like everything just so. I want to know what’s coming and see how everything and everyone can be improved upon. But in my brother, I find relief from this quest to be the best. In his presence, I don’t have to be. Sure, there are times I try to improve Brian’s behavior (according to my preferences) and pester him to death…isn’t that what siblings do? But my Type One-ness finds relief, not having to prove and earn myself around my bro. Full disclosure: Brian is not always happy with me. He was not amused when I lied to my parents about going to a party in high school. I didn’t drink while I was there, but when the “event” was recounted Brian piped in with judgment, “Uh, uh…just say no” (there may also have been a reference to breaking Commandments #5 and #9. Beloved Enneagram teachers, Suzanne Stabile and Ian Cron, talked with Ramsey Patton (an Enneagram One) about her work with the special needs community. Ramsey explained that her sense of justice as a Type One led her to defend those in the margins. I could relate; I once threatened to karate chop a kid who asked my brother if he was retarded (I had never taken karate, but I’ve seen Karate Kid more than once, so I was well prepared). And my sense of justice was pushed, full throttle, when I caught news of Iceland’s view on aborting unborn babies with Down Syndrome. That’ll get a big sister revved up! It makes sense that Type Ones would stand for justice, and defend others (siblings included) but how does the perfectionist navigate the unpredictable waters that come with having a sibling with special needs? Normally, the imperfect and unpredictable brings me great frustration, as I try to control and improve on all I can. But when I’m with my brother, I am presented with the fortunate opportunity to lower my unrealistic, tiring expectations and uncover great joy. And oh, how good this is for my try-hard soul. The heartbreaks I experience when Brian is made fun of, make me a more compassionate human, and less machine-like. The unknowns about his future, cause me to be less annoyed by his quirks and more thankful for time spent together. The way he picks out just the right card to lift my spirit, after 5 seconds of “looking” at the Hallmark store, never ceases to amaze me. Let me assure you, my brother is a gift to me. And here lies the key: in my brother’s presence, I feel freed from the need to measure up. I don’t have to impress him (but man, I hate disappointing him). 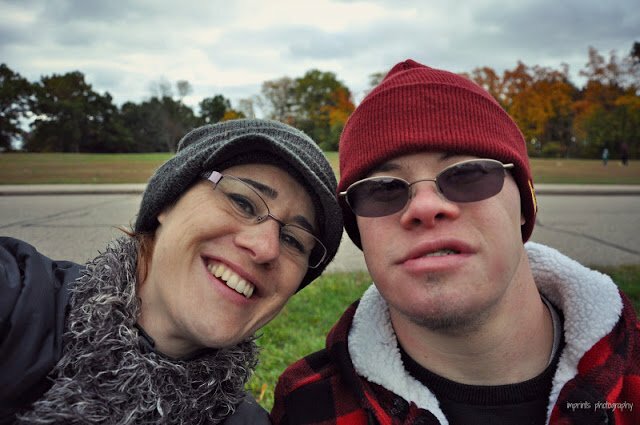 Having a brother with special needs has been the perfect solution for this imperfect, perfectionistic sister to move toward emotional health (try saying that five times). 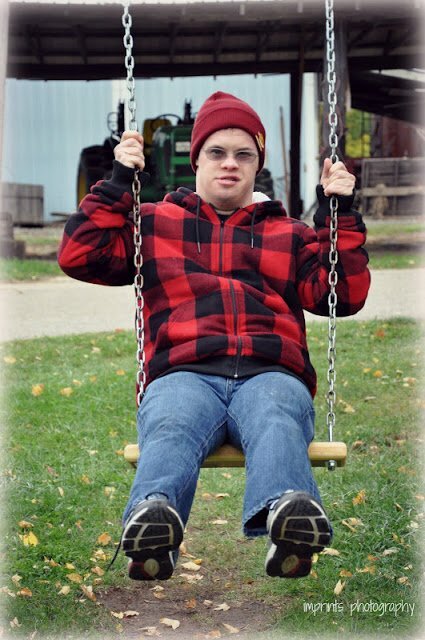 I’m not sure how it’s all going to turn out, but there is no doubt that having a sibling with special needs has enriched my life in countless ways. I’m less selfish and less controlling (although I’ve still got plenty of that to go around, don’t worry) and I’m more thankful and empathetic. I was given a most incredible gift by having a sibling with special needs. A gift wrapped in ribbons of unpredictability, taped with bittersweet moments, and stuffed with heavy doses of beauty. I am a better version of myself, because of him. To read more about Brian, read 31 Days with My Brother.